Sussex resident Arianne McGarrigle recently joined a tide of people to unite against dementia at Brighton and Hove Memory Walk. Arianne cut the ribbon to start the Alzheimer's Society's event in memory of her Grandad Ted who had dementia and for her Nan Rosemary who's living with dementia today. "So many people don't understand what life is like for people living with dementia and don't realise how devastating the condition can be. "That's why Alzheimer"s Society Memory Walks are so important, as every penny raised here and at the other walks around the country, help to raise awareness, fund vital research and ensure that people with dementia get the care and support they deserve." 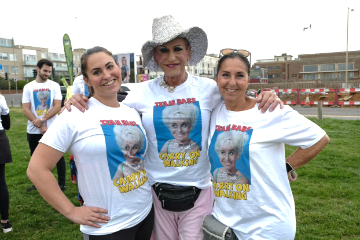 Also attending the walk in tailored-made Memory Walk Team Barbara t-shirts, was Dame Barbara Windsor's niece by marriage, Abbie Brackenridge, 31 and her mum, Scott Mitchell's sister, Marsha Alexander, 59. "It means so much to us to be here today, the atmosphere has been fantastic and so humbling. "As most people know my lovely Aunt Barbara is living with Alzheimer's disease and it's heart-breaking to see the condition slowly taking her away from us. "With funding for dementia research still too low it was so important for us to be here today, in our hometown, walking step-by-step with other people affected by dementia, helping to raise vital money so that one day we'll have a world without dementia." This year, Memory Walk aims to raise £9 million nationally and bring together more than 110,000 walkers across the generations. "Dementia is now the UK's biggest killer, with someone developing it every three minutes. "Dementia devastates lives; it slowly strips people of their memories, relationships and identities. "Every pound raised will help Alzheimer's Society provide information and support, improve care, fund research and create lasting change for people affected by dementia. "Alzheimer's Society is committed to spending at least £150 million over the next decade on dementia research to improve care for people today and find a cure for tomorrow."